Expansive split three bedroom with wide planked floors and high ceilings, adding to the already airy appeal of this generous- sized home.The pass-through and windowed kitchen also features stainless appliances and granite countertops. The baronial 697 square foot private terrace includes covered and uncovered sections. Full-sized washer and dryer adds to the convenience of this home. In addition to the functional space, our newly constructed building is equipped with energy efficient systems and a 350 kilowatt rooftop back-up generator which equates to lower utility costs and no chance of a blackout.VALUE abounds at 70 West with a 25 year tax abatement, low common charges and building amenities that include a free, fully equipped gym, expansive and furnished roof deck, low-priced parking options including charging stations for electric cars, 24/7 virtual doorman, bike storage, digital video intercoms, back-up laundry facility and low cost private storage. 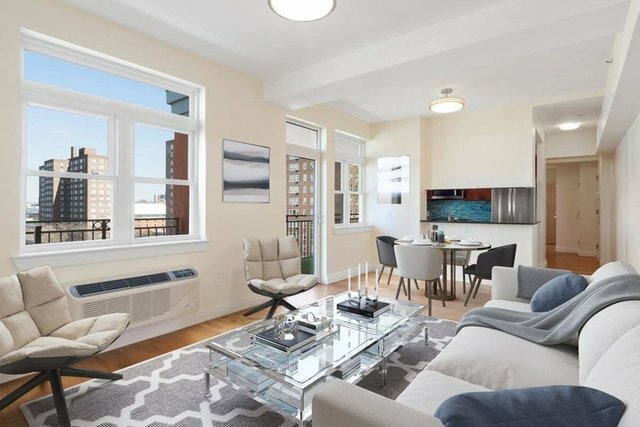 The convenient Central Harlem location is a few blocks from the 2, 3 trains, multiple buses, shopping, cultural and higher education institutions, parks, hospitals and more.